We take E-Safety very seriously at Dormers Wells High School. In a fast changing world, learning about E-Safety and how to exploit the amazing potential of online technology whist remaining safe and secure is a crucial aspect of our students’ education and wellbeing. At Dormers Wells High School we educate and protect our students in their use of ICT and the internet. We aim to constantly reinforce the responsibilities that our students have when surfing the web through ICT lessons, CPSHE lessons, assemblies and workshops. Our pastoral teams support students if they do run into difficulties and Year leaders cover E-Safety issues through assemblies during the year. Within school, filtered internet usage is regularly monitored. Obviously, we can only provide these safeguards within school – it is equally important that students are encouraged to use the internet safely and responsibly on mobile devices and outside of school. Remember that at Dormers Wells High School we are a TELLING school. We report problems and solve them together. Don't give out your personal information to people / places you don't know. Meeting someone you have only been in touch with online can be dangerous. Always check with an adult you trust. Accepting emails, files, pictures or texts from people you dont know can cause problems. Check information before you believe it. Is the person or website telling the truth? Tell an adult if someone or something makes you feel worried or uncomfortable. 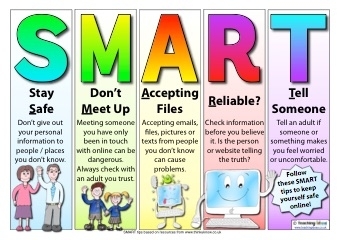 Follow these smart tips to keep yourselves safe online. We recognise that E-Safety issues are constantly changing and evolving and strongly recommend visiting the excellent ThinkUKnow website (www.ThinkUKnow.co.uk) run by CEOP (The Child Exploitation and Online Protection Centre).